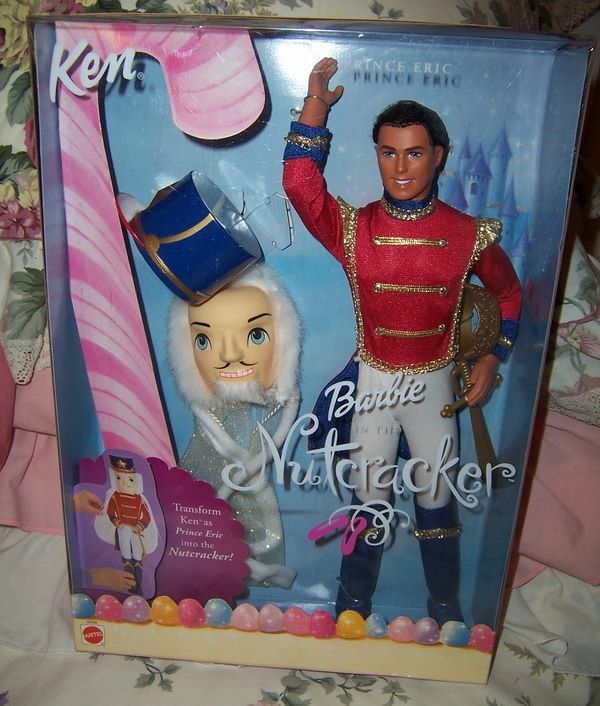 This is a MIB Ken doll who is Prince Eric and then can transforms himself into the Nutcracker with the provided outfit. The box is in great condition with a little scuffing - see photos. A wonderful Barbie Ken type fashion doll. 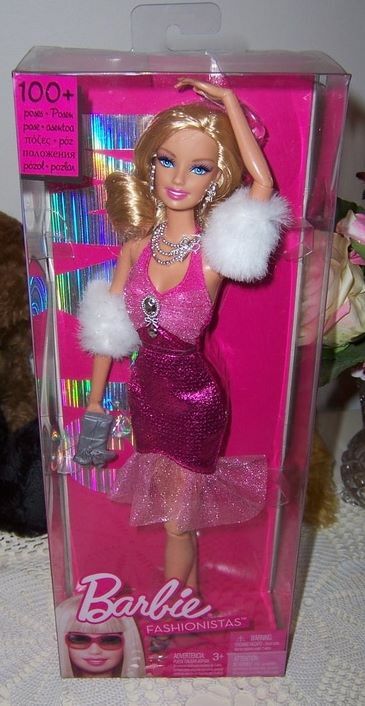 Barbie is all dressed up in her very glamorous party outfit and looks like she is about to go out for a nght out on the town. Her dress is a pink sparkly type fabric with a see though fabric frill at the bottom. She has silver jewellery, fur type muffs on her arms, black high heel shoes, and clutching a small silver bag. The box has Mattel Canada Inc. on it with many different languages on the back. A wonderful Barbie fashionistas doll of ''100+ poses''. 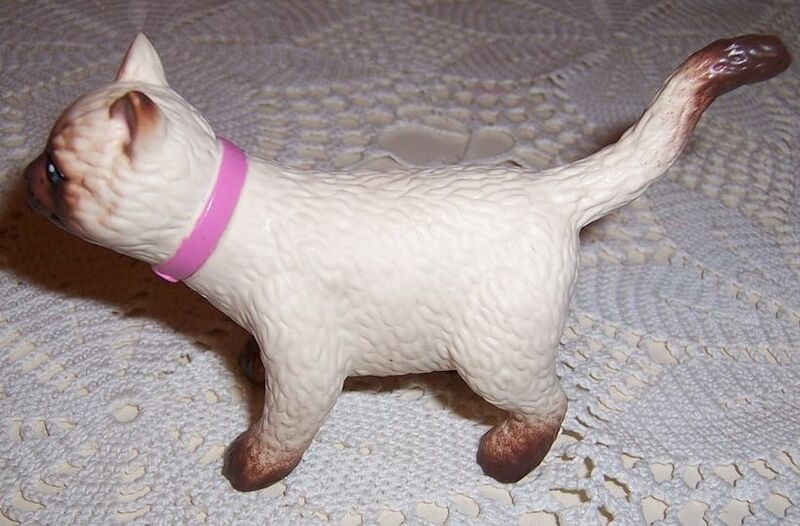 This is Barbie's pet siamese cat called Mika. She has a brown face with brown tips around her ears, and brown feet. Her body is mainly white. Mika can drink water from a water bottle into her mouth, and then her tummy can be pushed to make her wet into her kitty litter tray. She is missing her water bottle and is also missing her kitty litter tray. However she is a lovely toy cat. approx 7cm tal from feet to tip of ears. 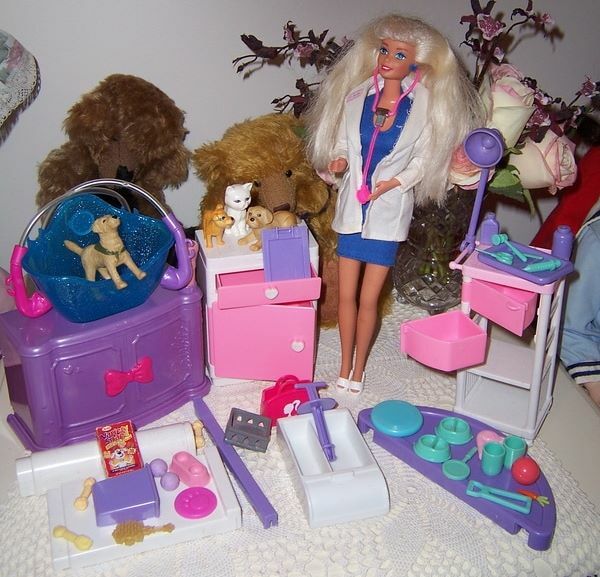 This is a partial Barbie Love'n Care Vet Play set from 1996 with other bits and pieces for pretend play. A wonderful lot of vintage items which are rare to find to make up a Veterinary Clinic for animals. In celebration of Barbie doll's 50th anniversary in 2008 the favorite Barbie dolls and period fashions were returned and recreated in loving detail. If you missed your chance before to own one of these dolls then now is your chance to have one - reproduction. 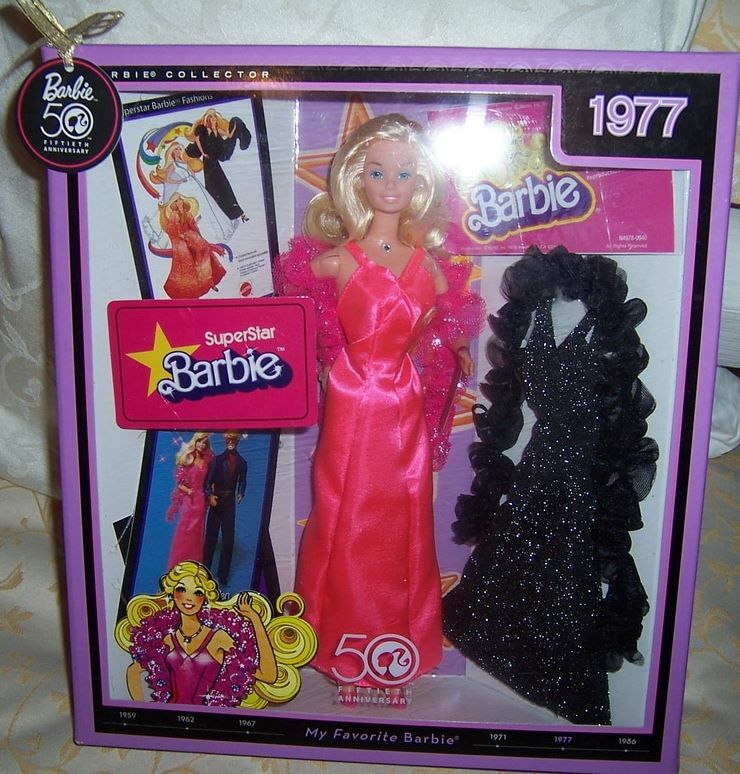 One highly sought after Barbie doll is ''Superstar Barbie'' from 1977. This doll featured a wide open mouthed smile and a softer friendlier look with long blonde hair parted to one side. This 50th anniversary version models a glamorous hot pink satin evening gown, complete with boa. Included in the package is a reproduction of a glamous fashion from the era, along with a reproduction vintage booklet. Finally, 50th anniversary collectible cards which each portray a vintage image production on one side and a fascinating little know Barbie fun facts on the back. The box is in lavender colour and is in excellent condition. This would be a lovely gift pack to give to that special person. 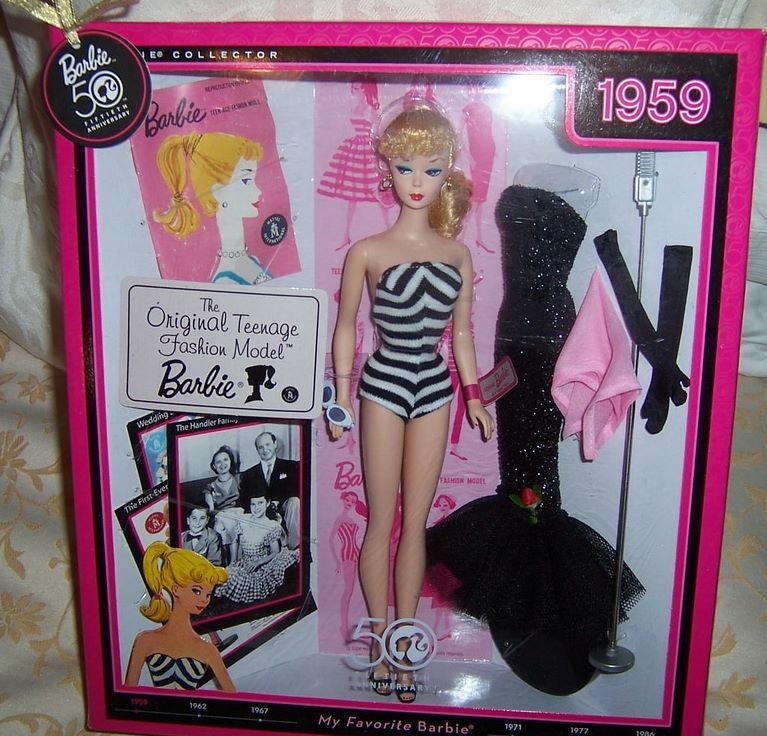 One highly sought after Barbie doll is the very first doll in 1959. She featured the now famous black and white bathing suit, sultry features, and the famous ponytail. This 50th anniversary version is the most faithful reproduction ever - even down to the foot holes made for the original doll stand. Included in the package is a preproduction of the very popular Solo in the Sportlight fashion #982 from 1960, along with a reproduction vintage booklet. The box is in pink colour and is in excellent condition. In celebration of Barbie doll's 50th anniversary, the favorite Barbie dolls and period fashions are returned and recreated in loving detail. 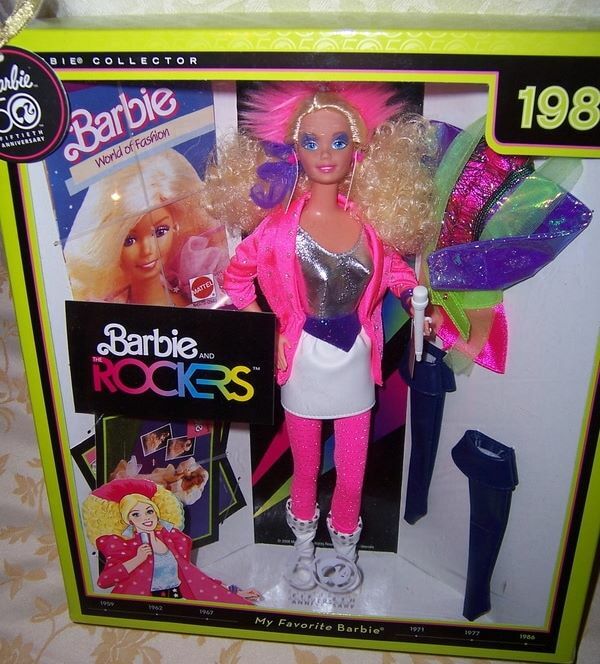 One much loved Barbie doll is the 1986 Barbie and the Rockers. This doll celebrated the new wave era dressed in a hot pink tuxedo jacket and hose, worn with mini skirt and metallic top. This 50th anniversary version models a totally repro ensemble. Included in the package is a preproduction of a period fashion, along with a reproduction vintage booklet. Finally 50 th anniversary collectible card which each portray a vintage image production on one side and a fascinating little know Barbie fun facts on the back. The box is in lime green colour and is in excellent condition. 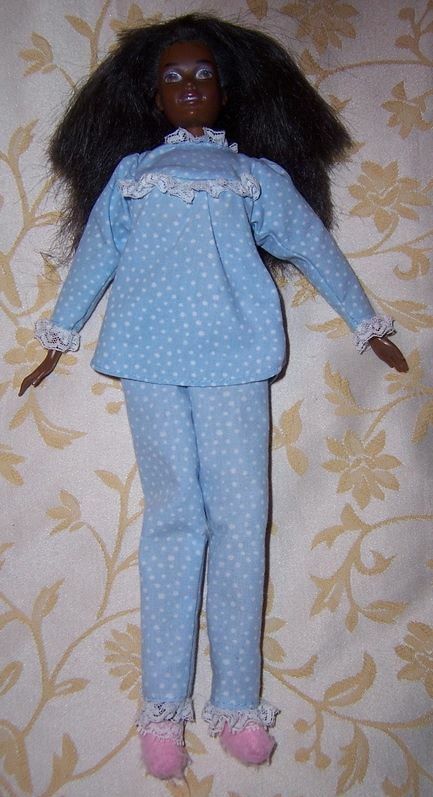 Bedtime Barbie was the first soft body Barbie doll that you could sleep with. She has a vinyl head and neck which can be moved to different positions. She also has 3/4 vinyl arms. The rest of her body is a soft stuffed bod. Her pink slippers cannot be removed but her two piece blue and white spotted pyjamas can be taken off.